The UAE’s National Drilling Company (NDC) has signed three key contracts worth $543 million to buy 14 new rigs, state news agency WAM reported. One offshore and an onshore rig, worth $203 million, will be built in the UAE, it said, quoting the company’s chief executive Abdullah Saeed Al Suwaidi. 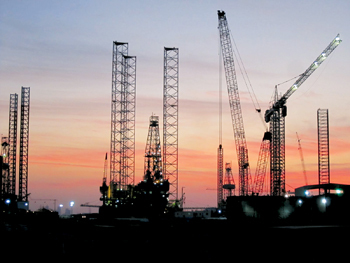 The onshore rig deal was signed with National Oilwell Varco , while the offshore one went to Lamprell. A third deal was signed with China Petroleum Technology & Development Corporation for 12 rigs, Suwaidi said. The new contracts are part of the UAE company’s expansion plans and also the result of growing demand from its customers, it said. Meanwhile, Qatar’s Gulf International Services (GIS) has leased out one of two jack-up drilling rigs whose contracts had gone idle and is also considering leasing out the second one, the oil services firm said. GIS said in April that the decline in oil prices was hurting the business of its subsidiary Gulf Drilling International, leading to the release of one previously contracted rig and cuts in day rates. GIS said two of its rigs were idle but one had already been booked for short-term work this year and a longer-term contract starting in the first quarter of 2016. The second rig is also being considered for work that may commence early next year. The company also said its customers had negotiated cuts of between 10 and 15 per cent to daily operating rates of drilling rigs.